Soaring 151 meters above the ground, the Gothic Cathédrale Notre-Dame de Rouen is the tallest church spire in France. It was built over the course of three centuries, and its varied architectural styles, from neo-Gothic spires to 13th-century stained glass, reflect the changing tastes of each generation. Its facade also bears the story of passing time and battles won and lost, from the Wars of Religion to World War II, when many of its windows were shattered. Owing to these frequent attacks and the natural aging of the building, the cathedral is constantly under restoration. So when one of France's top restoration firms, Enterprise Georges Lanfry, needed to reach the highest sections of the cathedral, they turned to Sarens for help. "It was a wonderful experience to work on one of the most iconic and historic cathedrals in France," says Paulo Goncalves, France Country Manager for Sarens. 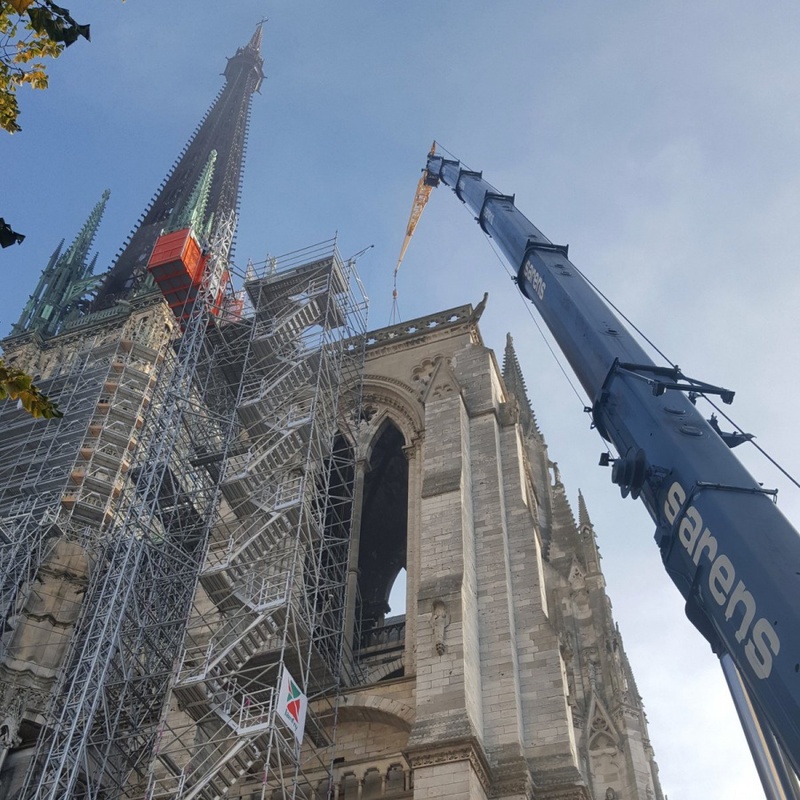 To lift scaffolding baskets to the top of the cathedral, Sarens deployed the Liebherr LTM 1160-5.1, moving it to the site location in less than an hour and quickly assembling it to start the operation. The Liebherr LTM-1160-5.1 is the perfect crane for delicate operations like this: it has long boom systems and very high load capacities, but it's also ideal for working in tight quarters, like the busy central area surrounding the cathedral. As Sarens operators lifted heavy scaffolding baskets above a narrow, busy road in the center of Rouen, they had to ensure the absolute safety of passerby below. They also had to maneuver carefully past the cathedral building and existing scaffolding as they hoisted each basket to the top. As always, the engineering and operations teams masterfully handled each challenge, executing their task on time and on budget. Sarens is proud to have been part of the effort to bring this spectacular cathedral back to its original beauty, and to live up to its promise:Nothing too heavy, nothing too high.